Amada VELA II mdl. VELA II-305050 30-Ton 56-Station CNC Turret Punch Press s/n VII-55363 w/ Amada-Fanuc-V System 6M Controls, 56-Station Turret, Manual Sheet Repositioner, 100” x 50” Ball-Top Table. Amada VELA II mdl. VELA II-305050 30-Ton 56-Station CNC Turret Punch Press s/n VII-55070 w/ Amada Amadan O4P-C Controls, 56-Station Turret, Manual Sheet Repositioner, 100” x 50” Ball-Top Table. Amada RG-80 80-Ton x 8’ CNC Press Brake s/n 806070 w/ Amada Controls, 94.6” Table Length, 98.7” Max Bend Length, 15.76” Throat, 3.94” Stroke, 80.8” Between Uprights, 14.56” Open Height. 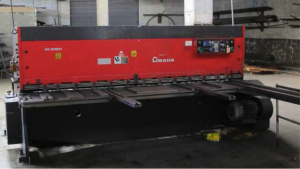 Amada RG-80S 80-Ton x 78” CNC Press Brake s/n 804786 (NO CNC CONTROLS) w/Dynabend Back Gage (NO CONTROLS), 78” Table Length, 82” Max Bend Length, 15.78” Throat, 3.94” Stroke, 13.79” Open Height, 59.9” Between Uprights. Miller Deltaweld 302 CV-DC Arc Welding Power Source s/n KJ025988 w/ Miller 60-Series Wire Feeder. Miller Syncrowave 250DX Arc Welding Power Source s/n LH500199L w/ Miller Cooler Cart. Miller Syncrowave 250DX Arc Welding Power Source s/n LH500131L w/ Miller Cooler Cart. Miller Syncrowave 250DX Arc Welding Power Source s/n LH010112L w/ Miller Cooler Cart. Lincoln Idealarc CV-300 CV-DC Arc Welding Power Source s/n AC-809801 w/ LN-7 Wire Feeder. Lincoln CV-300 Arc Welding Power Source s/n AC748584. Everlast PowerTIG 315LX IGBT Inverter Welding Power Source. Miller Cricket XL 115 Volt Wire Welder w/ Cart. Thermal Dynamics Thermal Arc PAK 3XR Plasma Power Source. Kimura Type SW-408PA 40kVA Spot Welder s/n 54811 w/ 24” Throat, Pneumatic Ram. 4’ x 10’ Steel Welding Table. Bliss SC2-200- 72X60 200-Ton Straight Side Stamping Press s/n 51031 w/ 8” Stroke, 18” Ram Adj., 22” Shut Height, 20-40 Strokes/Min, (2) Cushions, 60” x 72” Bolster and Ram Areas. Komatsu OBS110-2 110-Ton Hydraulic Straight Side Press s/n 10943 w/ 5.91” Stroke, 3.94” Ram Adj., 14.96” Die Height, 32-65 Strokes/Min, 27 ½” x 43 ¼” Bolster Area, 17 ¾” x 23 ½” Ram Area. Rousselle 10K60 100-Ton Stamping Press w/ 5” Stroke, 4” Ram Adj., 12” Shut Height, 50 Strokes/Min, 22” x 60” Bolster Area, 16” x 53” Ram Area.South Bend OBI-125.BG- AC 125-Ton Back Geared OBI Stamping Press s/n 84006 w/ Pneumatic Clutch, 4”Stroke, 4” Ram Adj., 17 ½” Shut Height, 40 Strokes/Min, 27” x 48” Bolster Area, 21” x 28” Ram Area. Heim mdl. 12A-OBI- BG 120-Ton Back-Geared OBI Stamping Press s/n 2773 w/ Pneumatic Clutch, 30” x40” Bolster Area. L &amp; J mdl. 100 100-Ton Back-Geared OBI Stamping Press s/n 100278A w/ Pneumatic Clutch, 5” Stroke, 4” Ram Adj., 18” Shut Height, 28” x 42” Bolster Area. Rockford mdl. 75W 75-Ton Back-Geared OBI Stamping Press s/n 6403-70 w/ Pneumatic Clutch, 4” Stroke, 3 ½” Slide Adj., 50 Strokes/Min, 15 ½” Shut Height, 20” Bed To Gibbs, 24” x 40” Bolster Area. Minster No.6 60-Ton OBI Stamping Press s/n 6D-18393 w/ Pneumatic Clutch, Ratcheting Incline, 4” Stroke, 3 ½” Ram Adj., 90 Strokes/Min, 16” Shut Height, 21” x 32” Bolster Area. Rockford 8-S OBI Stamping Press w/ Pneumatic Clutch, Cushion, 30” x 45” Bolster Area. V &amp; O No.5 50-Ton OBI Stamping Press w/ 22 ½” x 32” Bolster Area. Niagara No. 2 ½ 22-Ton OBI Stamping Press w/ 12 ½” x 19 ½” Bolster Area. Piranha mdl. P70 70-Ton Iron Worker s/n P70-961 w/ Punch Head, 14” Sheet Shear, 1 ¼” Bar Shear, 5” x 5” Angle Shear, 3 ½” x 5” Coping Notcher. DiAcro No. 8 Hydraulic Power Bender s/n 150108255 w/ 1 1/8” Bending Dies. AEM mdl. NBS250 “Narrobelt” 24” Belt Grainer s/n MO-2219 w/ Torit mdl. 84 Dust Collector. Jet mdl. SR-2236 36” x 22GA Hand Roll w/ 2” Rolls. (2) Whitney-Jensen mdl. 58 5-Ton Kick Punches. Niagara mdl. 180 Power Beader s/n 58785 w/ 14” Throat. Greenerd No. 4 Pedestal Arbor Press w/ Adjustable Table Height, Speed Wheel. Bracker mdl. RN280 Radial Orbital Riveter s/n 25811. Milford mdl. 313 Automatic Riveter s/n 3109 w/ 1” Throat, Bowl Feeder. TOS mdl. SN40B Geared Head Lathe s/n 040100731276 w/ 22.5-2000 RPM, Inch Threading, Tailstock, 10” 3-Jaw Chuck. LeBlond Regal 17” x 56” “Round Head Lathe w/ 30-634 Dial RPM, Tailstock. Hardinge Second OP Lathe s/n 59-23120- 1 w/ Cross Slide, Tailstock, 5C Collet Closer. Wells-Index mdl. 837 Vertical Mill w/ Heidenhain DRO, 3Hp Motor, 60-4200 Dial Change RPM, Power “X” and “Y” Feeds, 10” x 41 ½” Table. Bridgeport Vertical Mill s/n 86088 w/ Sargon DRO, 1Hp Motor, 80-2720 RPM, Power “X” and “Y” Feeds, 9” x 42” Table. Bridgeport Vertical Mill s/n 92296 w/ 1Hp Motor, 80-2720 RPM, Power Feed, 9” x 42” Table. Bridgeport Vertical Mill s/n 92010 w/ 1Hp Motor, 80-2720 RPM, 9” x 42” Table. Rutland Milling and Drilling Machine s/n 53185 w/ 8 ¾” x 28 ¾” Table. Chevalier FSG-3A818 8” x 18” Automatic Hydraulic Surface Grinder s/n M384B002 w/Chevalier Controls, Automatic Cycles, 8” x 18” Electromagnetic Chuck, Coolant and Filtration. Delta Pedestal Carbide Tool Grinder. 10” and 8” Pedestal Grinders.